Since the class I’m teaching ended today (grades are already done! ), I dropped by the Apple Store to tinker a bit with the new machines. I had the opportunity to run a few tests on the new machines including running Geekbench (I also ran it on a few others for baseline comparisons). Geekbench is a fairly straightforward (and unfortunately entirely synthetic) test of processing power and memory speed, though it appears to favor raw clock power a bit more than multi-core processing in its calculations. I was pretty pleased to see the numbers on the new machines, listed below with others I tested for comparison purposes. (Several recent discussions of the Geekbench numbers for the new machines are comparing 64-bit test numbers to 32-bit numbers, which is an apples/oranges situation, so I wanted to use the same measurement across the board). Actually closer than I’d expected, to be honest. The Mini held up well here. Granted, the Geekbench numbers are very processor/memory focused, so the advantages of the machines with discrete graphics are minimized in such a test, but the new machines stack up pretty well overall nonetheless. Mini: OpenGL: 24.84 fps; CPU: 2.53 pts. 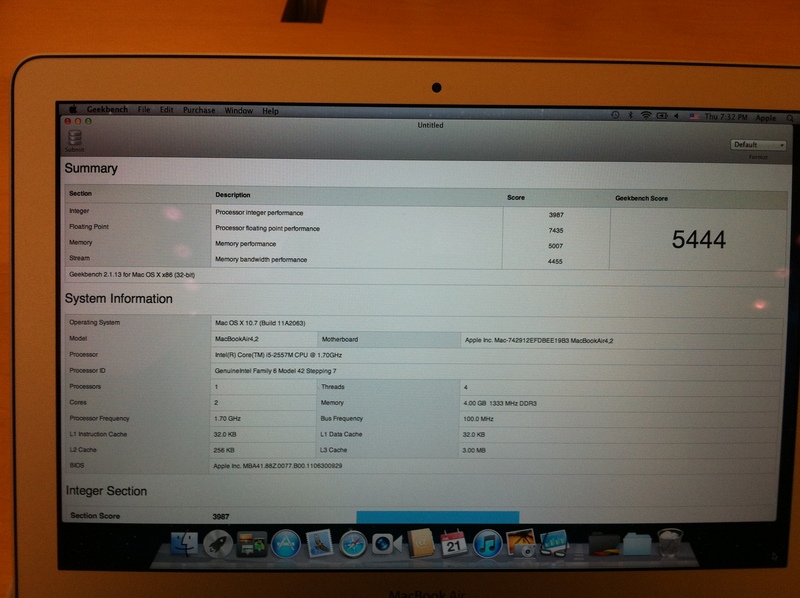 iMac 27″ (2.7GHz Core i5, 4GB RAM): 45.59 fps; 4.27pts. Oddly, the second iMac scored higher on the OpenGL test, despite having the weaker video card. I’m guessing this was due to the higher TurboBoost speeds of the 2.7 Core i5 processor in that machine. The Mini did quite respectably in this test as well, though still only about half the speed of the iMacs in more intensive operations. I’d love to see how the Mini Server, with its quad-core Core i7 would compare in these tests, especially in the OpenGL test. The Mini didn’t feel quite as snappy as the 17″ or 13″ Macbook Pros when I was running them through tests, but it wasn’t exactly sluggish, either. As might be expected, the SSD-toting Air felt snappier than any of the others, although its raw power still lags behind its bigger brothers. After seeing these numbers and getting my hands on these machines, I’m likely to switch my current setup (a 15″ Macbook Pro serving as both mobile machine and home hub) to a Mini/Air combo. That’s still not 100% decided, but I’m pretty close to making the switch. These machines finally have enough horsepower to at least make me think about it. With the White MacBook out of the lineup, what do you think is the best replacement? The Air or the base 13′ MCP? I think the Air is the better machine for most folks at this point. The people for whom that’s not true are the true power users who really need the additional power of the MBP, and those folks are going to want the 15″ or 17″ MBP anyway. I fully expect the next MBP update (likely second quarter of next year) to involve a case redesign that brings them much closer to the Air. I wouldn’t be surprised to see the MBPs drop the optical drive within the next couple years to make that happen. The move towards an Air-style case only really needs a larger Thunderbolt accessories footprint—as more Thunderbolt hubs get out there at affordable prices, the need for more in-case ports is reduced, and since the optical drive has been EOLed, the clock is ticking on the present MBP design.